Click here to download Interview and Dramatic Reading with Chef Rev. Dr. Lise Worthington. Rev. 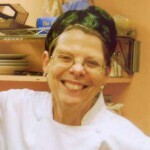 Dr. Lise Worthington, Chef and minister, trained at the Culinary Institute of America, Hebrew Union Theological Seminary and Union Theological Seminary. Her passion -- the love affair between food and faith -- influences not only her theology but a willingness to share the creative, spiritual and wisdom filled message: food matters. I met Dr. Worthington at this year’s World Congress where we both attended the advanced course in Logotherapy, Franklian Psychology: The Theory and Therapy of Mental Disorders. Dr. Worthington did a dramatic reading as part of the class that impressed me so much that I asked her to record it to share with our Logotalk Radio listeners. An Introductory course in Viktor Frankl's logotherapy in Hebrew is starting October 25 in Jerusalem and the same course in English is starting November 3 in Efrat, Israel. Pre-registration is required. Email me at logotalk@pld.com for the telephone numbers to use for preregistration.